The IPL is back and this time with a whole new look. There are new teams, new players, new jerseys as well as renewed enthusiasm among the cricket-crazy fans of the country. 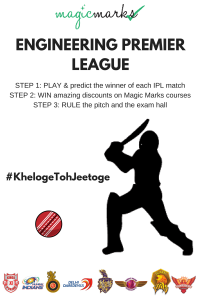 Keeping in mind the pulse of the nation and T20 fever among the youth, we at Magic Marks have developed a fun game called the Engineering Premier League, which will not only test your knowledge of the sport but also provide you constant opportunities to win great discounts on Magic Marks products as well as free subjects of your choice. What is Engineering Premier League? 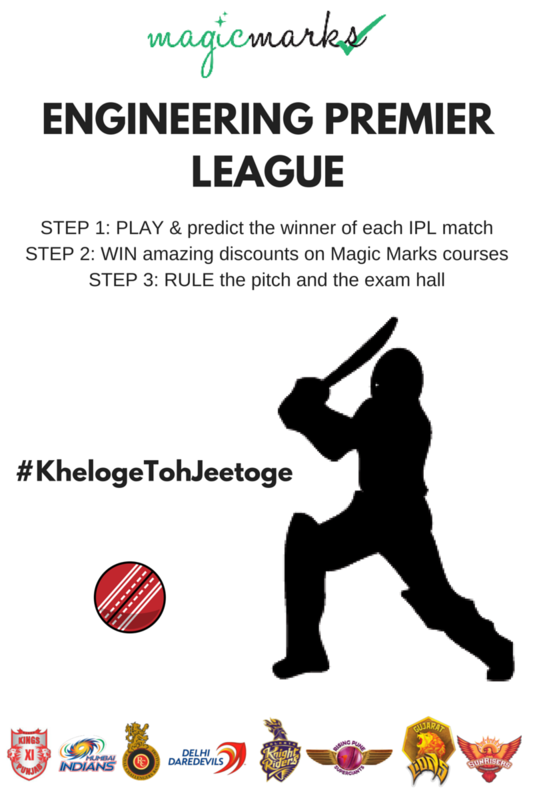 Engineering Premier League (EPL) is an online IPL prediction game brought to you by Magic Marks for all engineering students. IPL is extremely popular among the youth in India and a big part of the youth pursue engineering studies. We have designed the game such that students will enjoy watching the match as well as win discounts that will allow them to buy their course subjects at lower prices. To explain in cricketing terms, it’s two wickets with one ball. For purchases up to Rs.1000, you can use 1 coupon. For purchases up to Rs.2000, you can club and redeem 2 coupons together, i.e. Rs. 400 discount. For purchases up to Rs.3000, you can club and redeem 3 coupons together, i.e. Rs. 600 discount. For purchases up to Rs.4000, you can club and redeem 4 coupons together, i.e. Rs. 800 discount. Users cannot club more than 4 coupons together. So what are you waiting for? Select your team, enjoy the match and start winning along with the teams. Happy Playing! Happy Studying! Mechanical engineering is the discipline of engineering, which is considered to have the biggest scope for learning. It consists of various areas of study like motion, energy, dynamics, manufacturing and machines to name a few. Thus, it is no surprise that it is a well sought after the course as the demand for mechanical engineers is increasing day by day. A mechanical engineer is typically expected to study design issues and come up with solutions related to them, design and test working models for their functionality, analyze the testing and make required modifications as well as monitor all these processes. Magic Marks is an eLearning portal that aims to provide complementary education to engineering students of India, besides their regular classroom courses. It boasts of being one of the most rapidly growing digital learning platforms in India. You can check out Magic Marks’ Mechanical Engineering detailed study materials at www.magicmarks.in. The entire course content is provided in the form of 2D video tutorials along with a crisp and clear English voice-over. 1) Machine Design – Machine Design is the discipline which teaches students the know-how of designing a machine and its parts to fulfill the purpose of Mechanical Objective, Optimum Material usage as well as the safety of operation. The design process includes the application of scientific principles, technical knowledge, and creative skills to meet the needed criteria. The subject covers the designing of Transmission Shafts, Fasteners, Lever, Keys and Couplings, Pipe Joints etc. 2) Materials and Metallurgy – Materials and Metallurgy deals with the foundations of Crystal structure, semiconductors, alloys, ferrous and non-ferrous materials etc. It also involves the study of their properties and testing. It covers various heat treatment processes and phase transformation curves. 3) The strength of Materials – The strength of any material refers to the maximum internal resistance that the material can offer to any external load. The external load attempts to deform a body, thus causing stress and strain to develop in the body. This area of study deals with Stress and Strain analysis in various types of loading conditions.